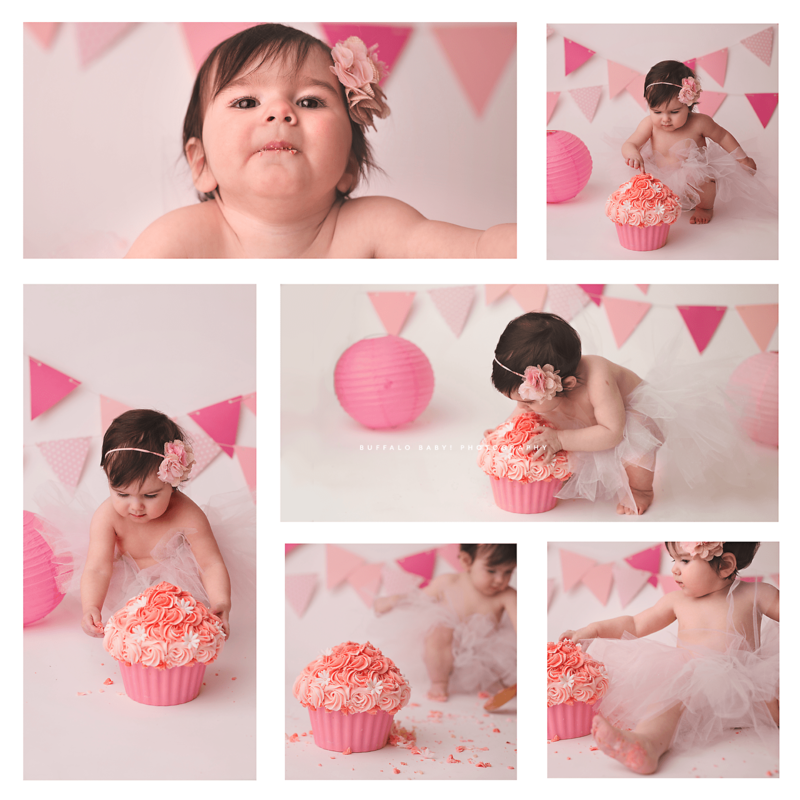 Aryana came to see me for her birthday and cake smash portraits! I last saw this cutie pie for her first holiday portraits and she stole my heart then. She’s such a beautiful little baby and to top it off had the best personality! I couldn’t have asked for a better session. She was happy doing whatever as long as we let her move because she was already on the move. Too busy to sit longer than a couple of seconds. I’m always prepared for the movers and shakers. I move fast with them as well so they don’t get bored with me right away. 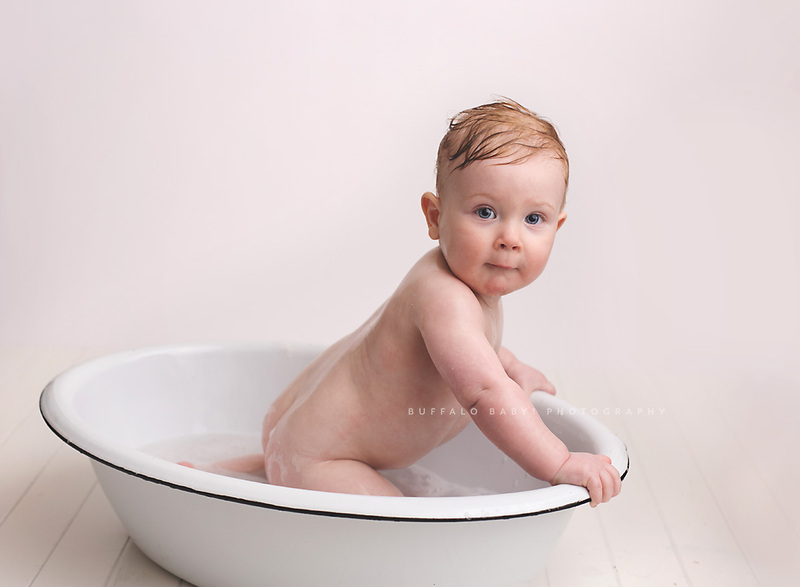 This age can be tough because at one they would rather explore or be very close to mommy and daddy. Buffalo Baby! 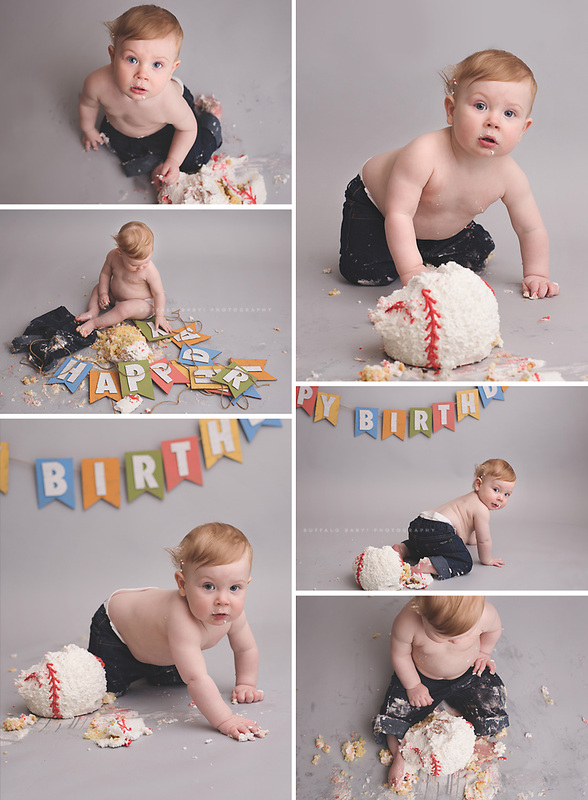 Photography would love to be your photographer for you Buffalo NY first birthday cake smash! 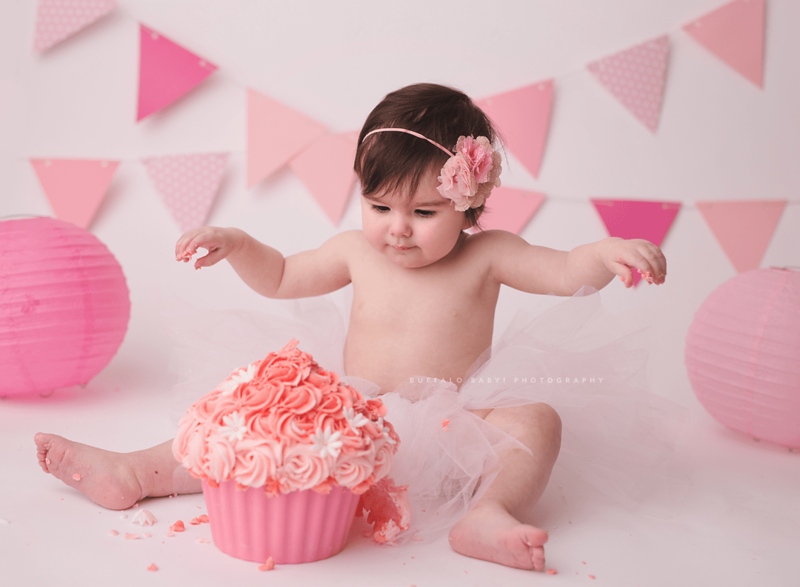 Aryana was not shy at all though and we had so much fun with her portraits and cake. Happy Birthday baby girl. 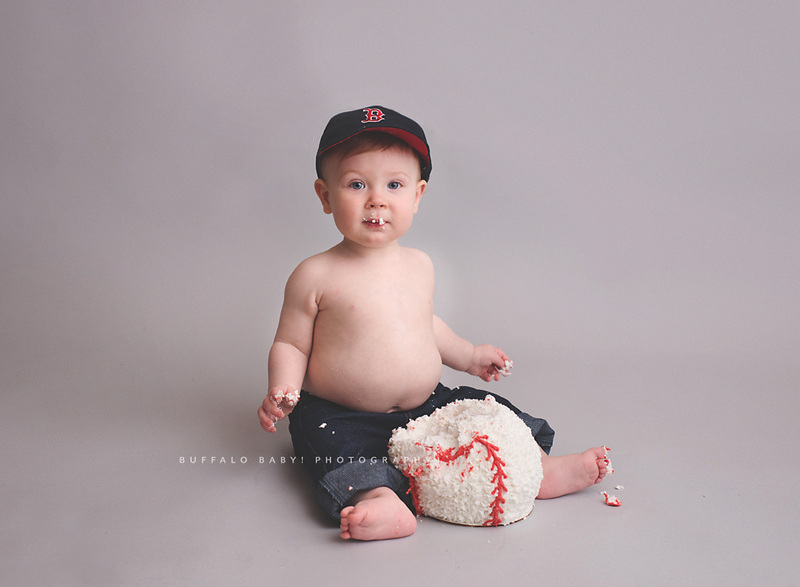 If you’re looking for some messy fun too and you would like to book a Buffalo NY first birthday cake smash please contact me for more information. You can also check out my investment page for packages and pricing. 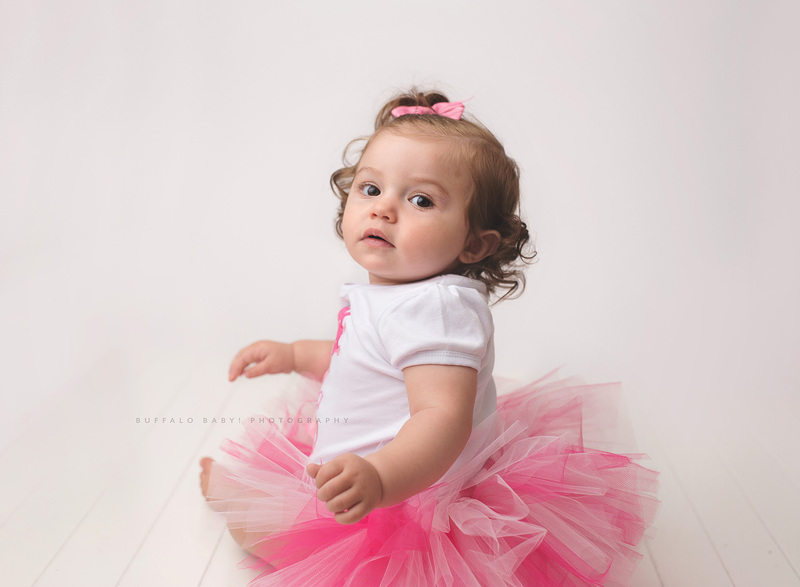 Buffalo Cake smash – Evelyn Turns One! 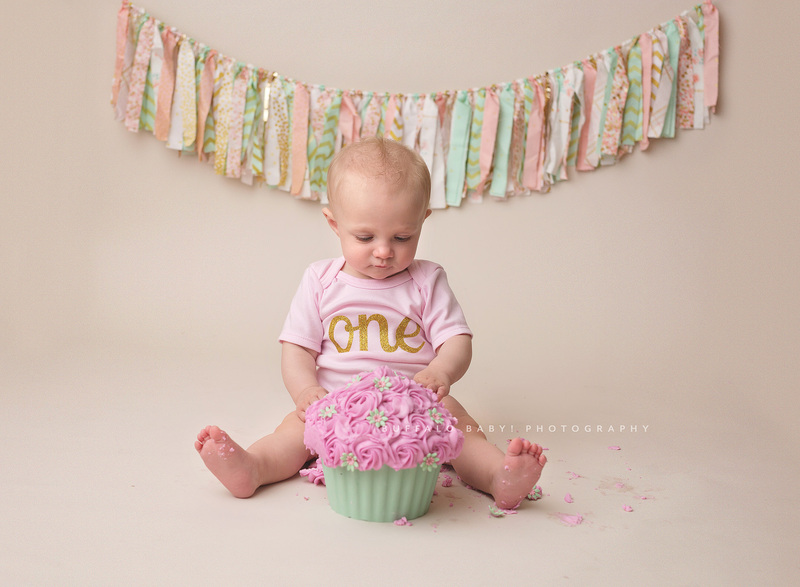 Evie’s first birthday and Buffalo cake smash session was a hit! Evie here was one of my last sessions in 2015! I last saw her at around 4 months and she’s gotten so big, even though shes this sweet little dainty thing. 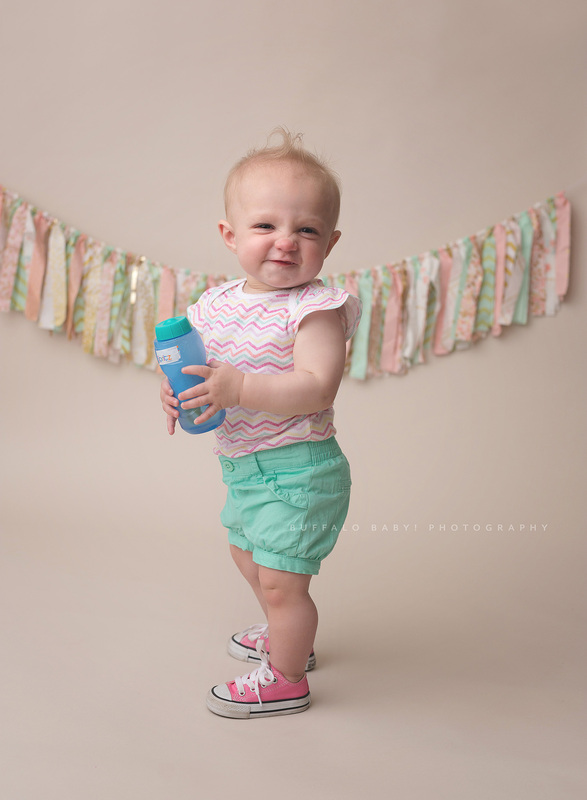 She turned one and we had so much fun, look her gorgeous smile! Big sister Ella got to join in on the fun too, I loved they’re matching dresses.Evie is such a smiley happy baby, unfortunately she didn’t want much to do with her cake. She would rather share with mommy of course. That’s ok baby girl you looked so sweet while it lasted. Thank you for coming to see me again and thank you everyone for a great year! Another fab cake by Wee Ona Bakery. This little girl is growing up way too fast! I first met Stella and her pretty awesome family for her newborn session. I really appreciate my clients returning to see me but I’m even more excited to see how much my little clients have grown. Stella is no exception, she has the best personality and a super cute smile with her crunchy nose and cute little curl on top. I also have never used these colors before, they were my favorite so far! 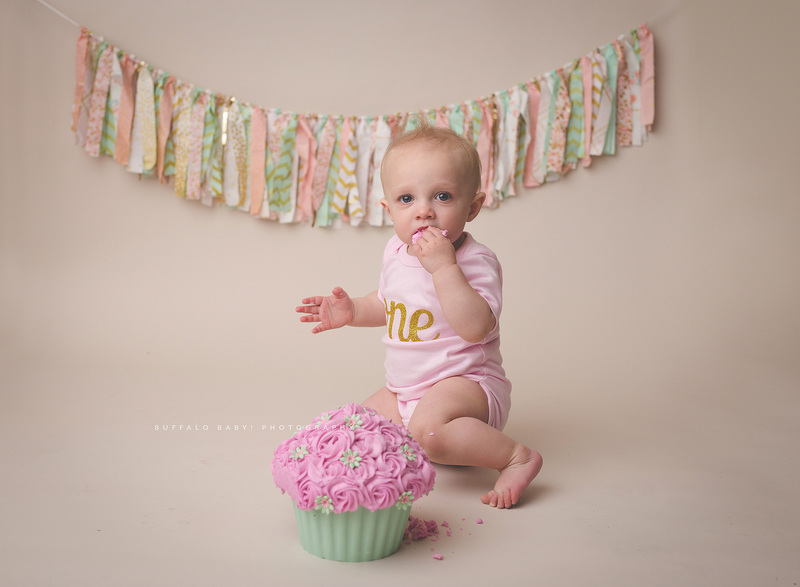 Her aunt even made the banner for the session, check out Stella’s session below. Cake made especially for Stella by Wee Ona Bakery. 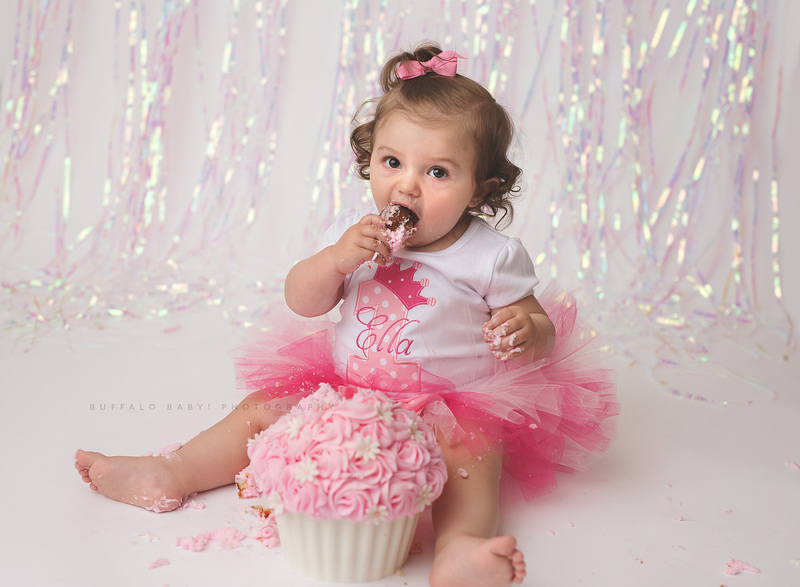 Happy first birthday Ella!! What a gorgeous little girl I had the opportunity to photograph. She was totally into her session posing and being gorgeous. Her mama and daddy got into it too!! What a sweet little cake smash this was. As always the gorgeous cake is made by Wee Ona Bakery! 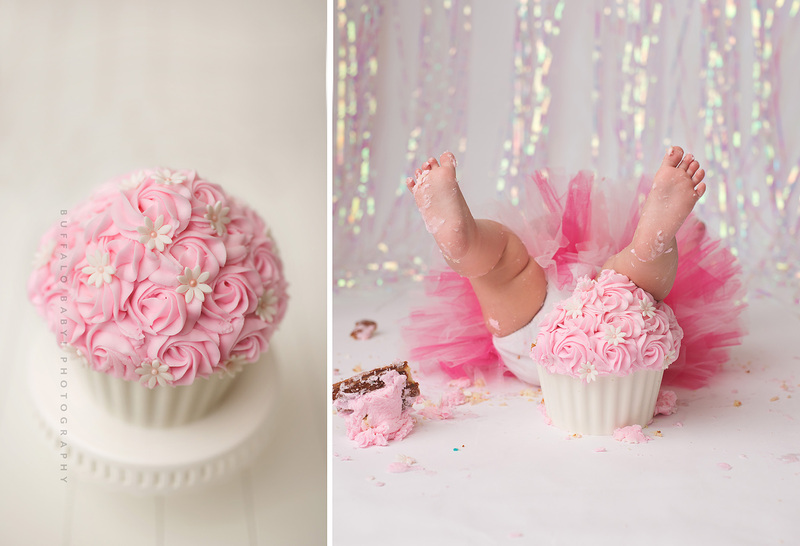 A mini cake smash session is the perfect session to have as a memory of your little ones first birthday. I customize the session for you right down to the cake! 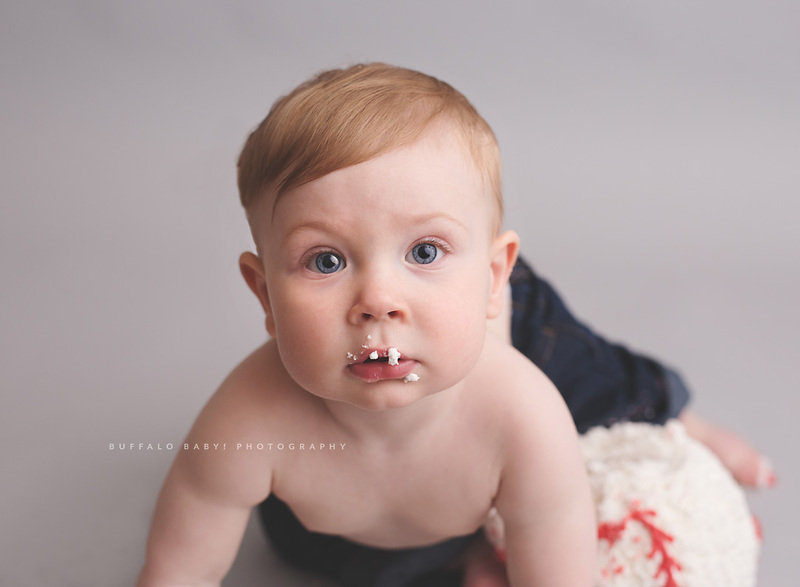 Jack’s mini cake smash was so much fun!! He was such a good boy and loved having fun with his baseball themed cake. Wasn’t real happy to get his hat dirty though so we quickly snapped a few then let him take it off! I really couldn’t have asked for a better one year old. This age can be trying sometimes. They might be teething or running! So far I haven’t failed to capture any of these beautiful faces yet and I don’t plan on it. It’s too much fun watching them dig into their cake and smooshing it all over their cute little faces. The parents are super funny too, we almost always all get into the action, singing, dancing and making faces. I should have someone do a video of one of these sessions. 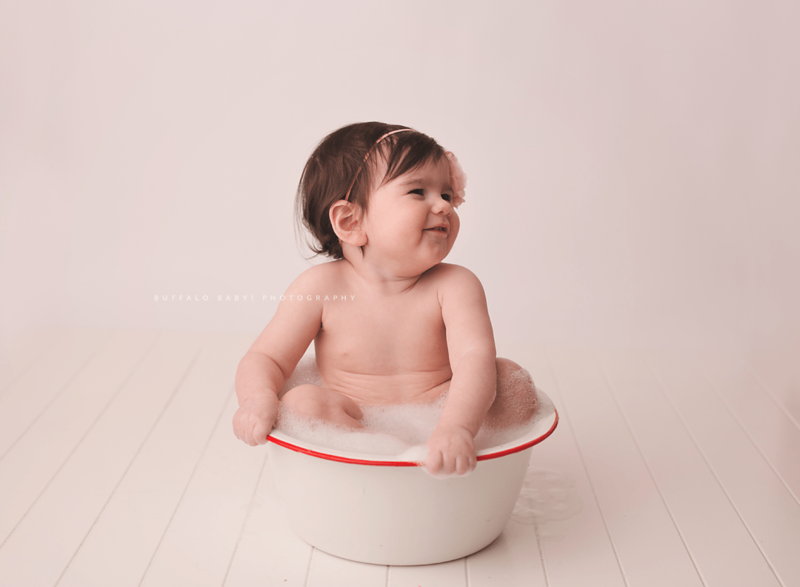 The tubby time can be pretty amazing too. With your choice of a tubby after, I use my big wash bin and they get all cleaned up but not until there’s some splashing going on! The fun of having it in someone else’s place is I let them get crazy playing and splashing. No holds bard people! 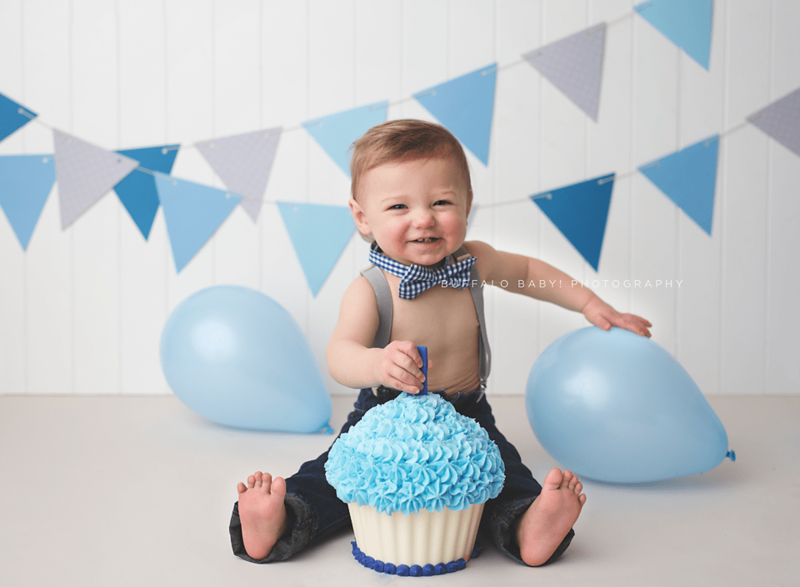 Here are some cute images from Jack’s sessions, as always my cakes are made by Wee Ona Bakery. She makes the yummiest desserts fro any occasion. 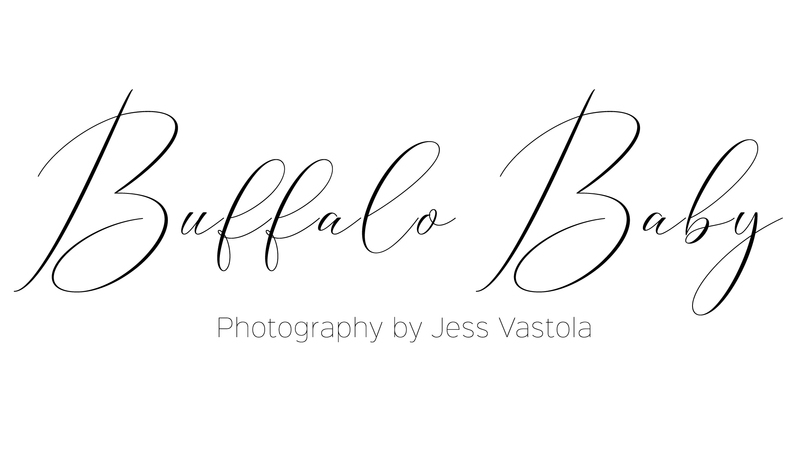 Feel free to visit my investment page to check out more on booking a First Birthday session with Buffalo Baby! Photography! Oh Lily!! This little beauty came to visit me in February to celebrate her birthday. We had so much fun with her but she was not interested in any of my shenanigans that day. Mom thought it may have been teething as she barely slept the night before but I just gave her breaks and cuddle time in between. As a bonus I was able to catch some super sweet moments of Lily with her mommy and daddy. 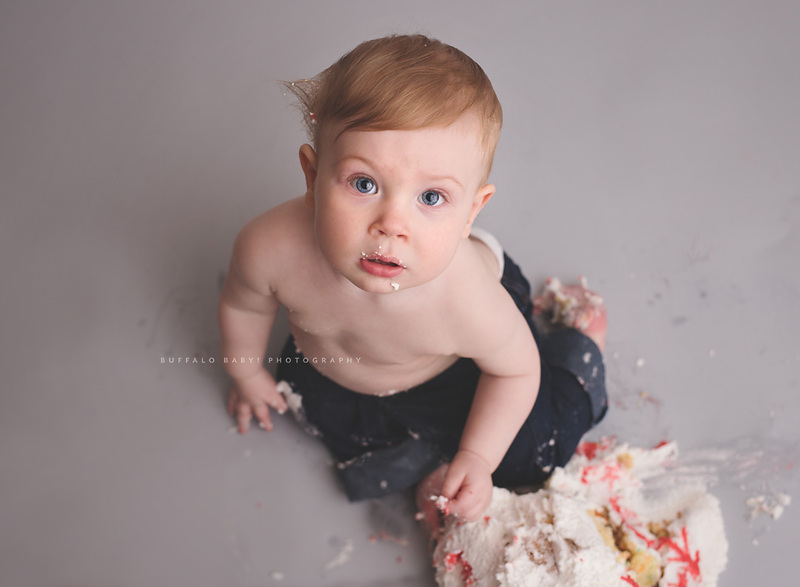 I just love capturing babies at any stage but the cake smash is so much fun and I get to grab some sweets with them during their session too! 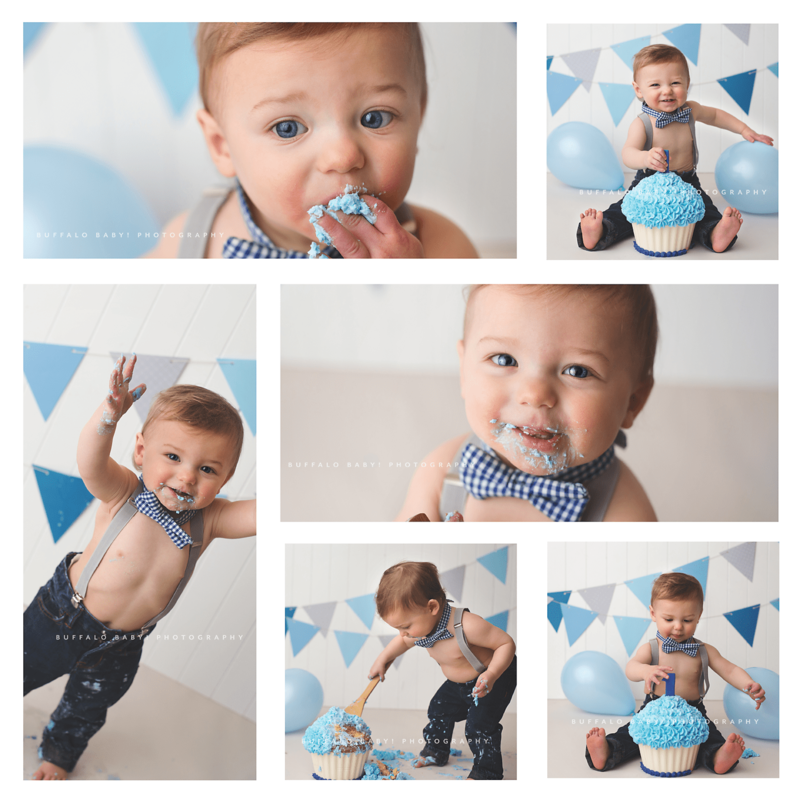 If you would like more information on this type of session please visit my First Birthday and Cakes Smash Investment page. 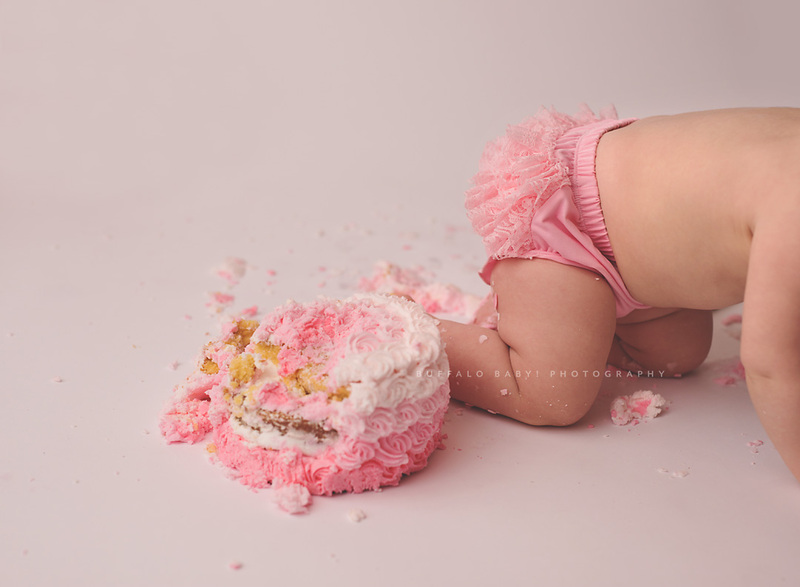 Oh how I love shooting cake smashes! 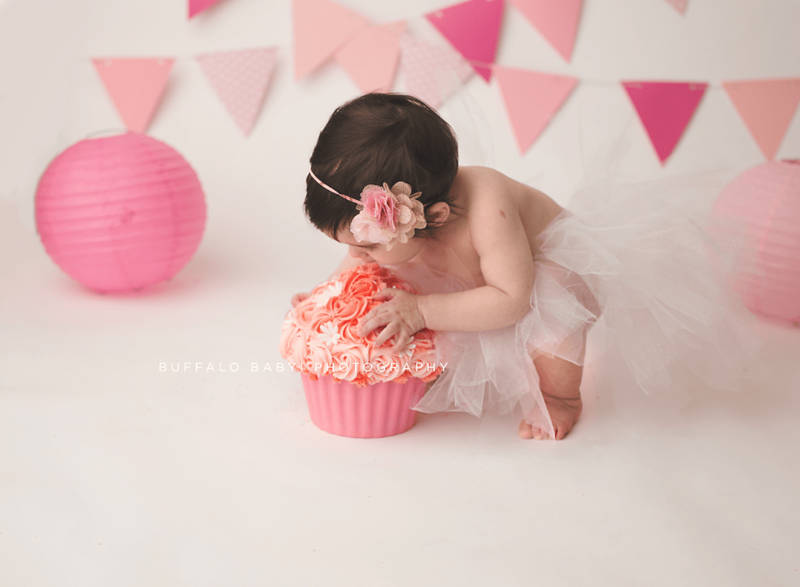 If your looking for a first birthday photography Buffalo NY with a super fun cake smash, look no further. Where else can you bring your child to make a complete mess, through around cake and leave the mess for someone else to clean it? Me, me… oh oh pick me!! Yes, you read that right! I let these little guys go crazy, some have never even had a taste of cake yet. It’s like being the fun aunt for an hour or two and sending home full of sugar. Well, not really but you know what I mean? Madison was actually one of my first newborns. She was just as sweet new as she is now. Such a happy sweet little girl. Like really really happy. I love when I have so many images because they give you so many expressions. Madison was FULL of them at her cake smash and was so ready to perform for everyone. 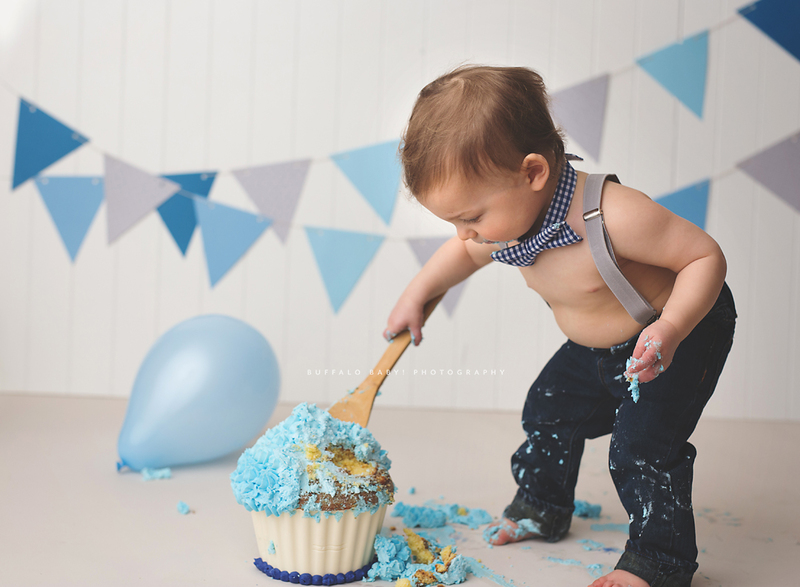 The cake smash is also not complete without tubby time. All the babies love tubby time!! Wee Ona Bakery outdid herself with this cake too, it was so beautiful and exactly what momma and I had in mind. 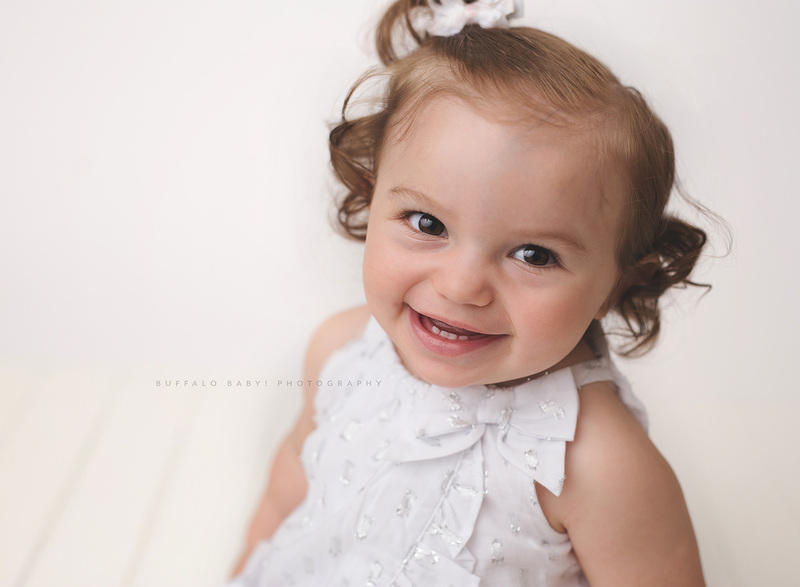 If your looking for a fun and customizable first birthday session in Buffalo NY please contact me for more information. 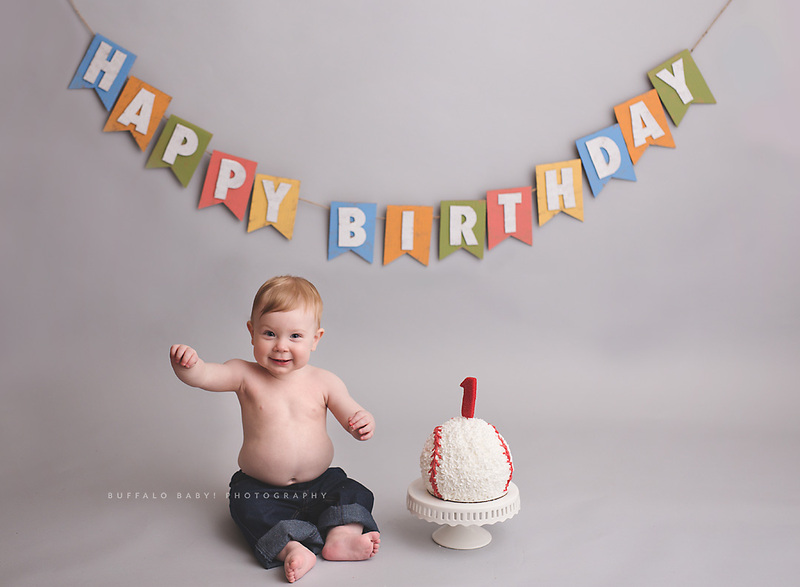 Look who’s turning ONE and celebrating by having his first birthday cake smash with Buffalo Baby Photography! Owen was honestly the happiest one year old I’ve ever seen. He and his momma are the sweetest too. He was walking already but he was so good and such a ham for the camera. Own loved to show us his super contagious smile, often, and how big he is. SOOOOO Big! Who doesn’t love when their baby does that!? It’s so cute and silly. Owen was so good that I was able to get a couple shots of him sporting some Rusterior Design threads. I just had to, they have little buffalo’s on them! Doesn’t he look so handsome in them? I LOVE supporting a local store, check out their shop some great stuff for everyone! 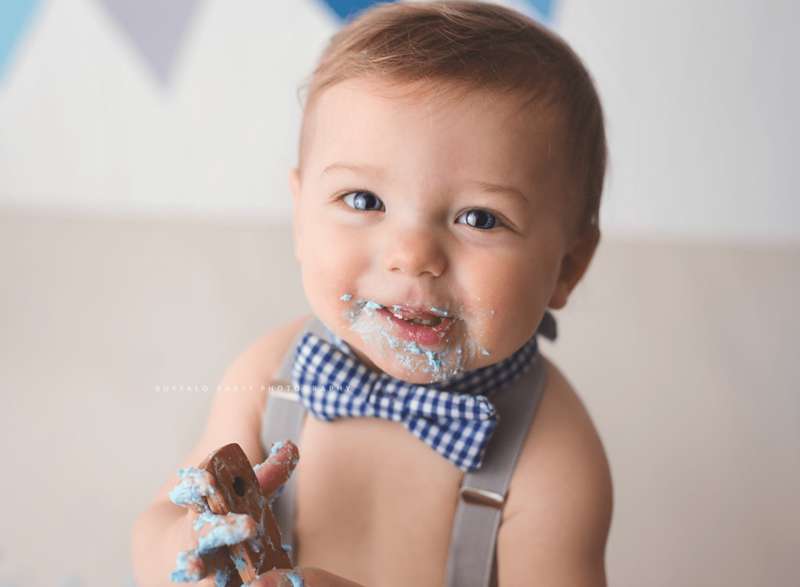 Owen had so much fun with the cake too! 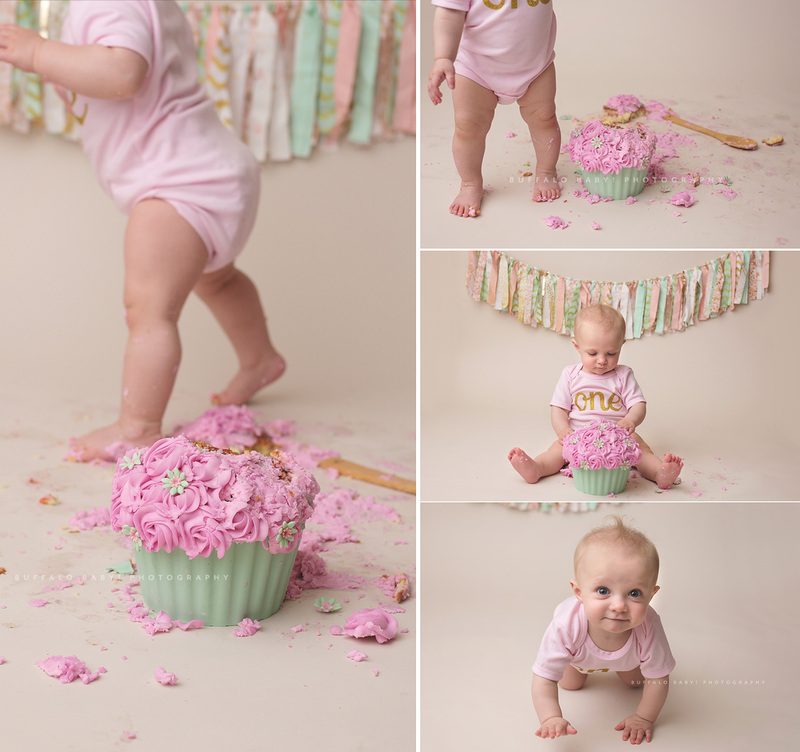 Wow… I can’t believe I’m already photographing Kara’s first birthday cake smash!! I can not even express in words how happy I am to see this little face grow up. 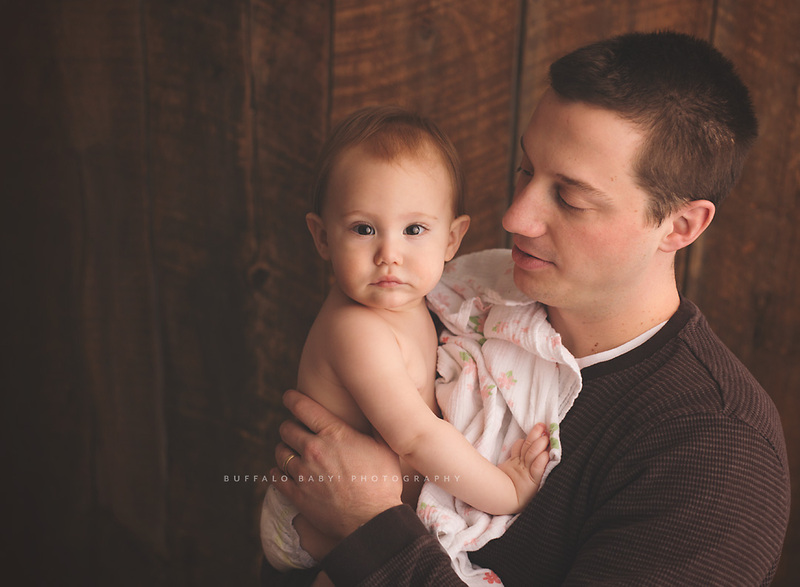 I originally saw Kara and her pretty awesome parents for her three month session. She was so good for me, she even fell asleep and I was able to pose her like a newborn! That was then and now Kara is ONE! 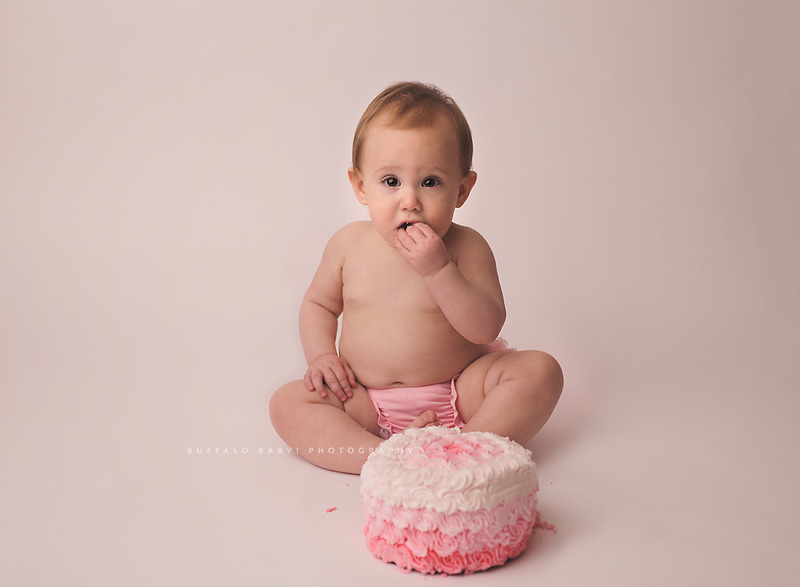 I recently photographed Kara for her first birthday and cake smash and she was as good as the day I met her. She’s such a sweet little girl. One can be rough for this little ones sometimes. 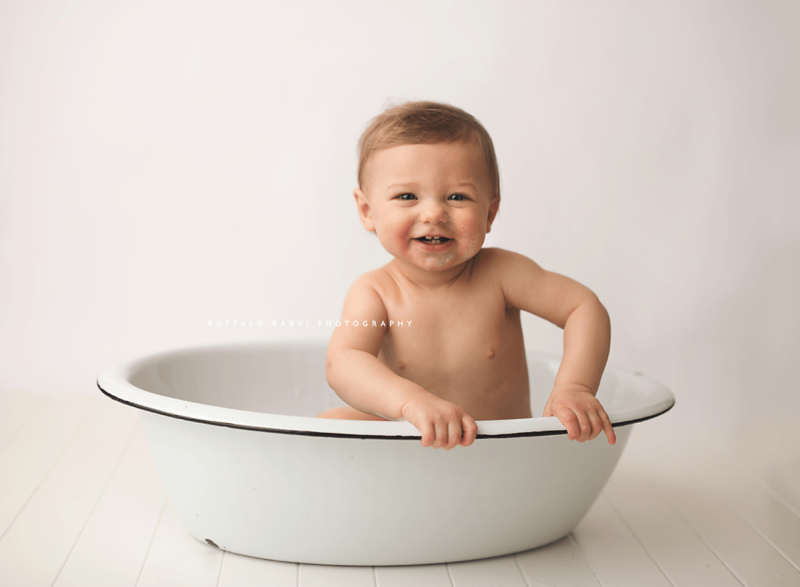 Teething and refusing naps can take a toll on them and their parents so I always take their ques into consideration when it comes to how far we push this session. You don’t want to overwhelm these super independent littles. Well, as you can clearly see we had fun and Kara enjoyed some cake too! This little blue bonnet shes wearing by Lavender Blue Baby was one she wore for her three month session too! As always the yummy cake is by the fab Wee Ona Bakery.